MOSCOW. Sept 25 (Interfax) – The active stage of the new genetic tests in the assassination case of the tsarist family has begun, senior criminal investigator of the Main Criminal Directorate of the Russian Investigative Committee Vladimir Solovyev told Interfax on Friday. “Experts are doing very active work. Everything necessary is being done,” he said. 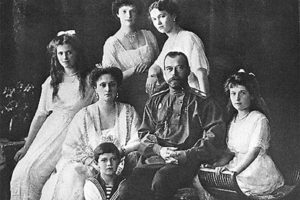 The investigative committee resumed an investigation into the criminal case over the assassination of members of the tsarist family. The Russian Investigative Committee said that additional tests are being conducted to confirm the authenticity of the remains of Tsarevich Alexei and Grand Duchess Maria. Their remains are being stored at the Russian State Archives. The samples of the skulls of Nicholas II and his spouse Alexandra, as well as the samples of the clothes of Russian Emperor Alexander II were taken for a new expertise, Solovyev said. “We have the genotype of the father, mother and children. All tests will be conducted in Russia,” Solovyev said. “His Holiness Patriarch Kirill asked to do all this from scratch,” says Solovyev, who has investigated the assassination case of Nicholas II and his family. The new genetic expertise on the execution case of the tsarist family will be conducted as quickly as possible, but it is still unclear whether it will be completed before October 18, Solovyev told Interfax on Thursday. Members of the working group of the Russian government named the date of October 18 for a funeral ceremony of the remains of Tsarevich Alexei and Grand Duchess Maria in St. Petersburg.